Amebiasis (am-e-BY-a-sis) is an infection of the large intestine by the single-cell parasite Entamoeba histolytica (ent-a-ME-ba his-to-LIT-i-ka). It frequently causes diarrhea or dysentery. 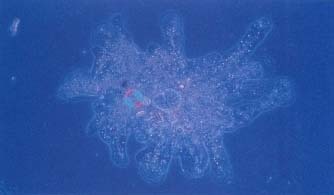 Amebiasis is a disease caused by an ameba, or microscopic parasite * , called Entamoeba histolytica. At one stage in the ameba's life cycle, it is enclosed in a protective wall called a cyst. Infection begins when a person swallows cysts in contaminated food or water. Amebiasis is found worldwide, including the United States, but it is most common in tropical areas where sanitation is poor. When swallowed, the cysts resist destruction by stomach acids and travel to the intestine. In the intestine, the amebae (plural) emerge from their cysts and multiply, usually without causing any symptoms. In some people, however, for unknown reasons, the amebae invade the walls of the large intestine, where they cause abdominal pain, bloody diarrhea (dysentery), and sometimes fever. At this stage, there is a danger that the ame-bae will invade other body organs. During the infection, the amebae produce cysts that pass out of the intestines in the stools. Outside the body, the cysts can survive for days or weeks. In areas with poor sanitation, drinking water contaminated with human waste can quickly spread amebiasis and the cycle begins again. What Are the Signs and Symptoms of Amebiasis? Most ameba infections are asymptomatic, which means there are no symptoms. Even without symptoms, however, cysts are still produced, and the person is considered a carrier or cyst passer. Symptoms occur primarily when the amebae attack the wall of the large intestine. This is known as amebic colitis. The most common symptom is abdominal pain that begins gradually. Additional symptoms may include diarrhea that contains blood or mucus, frequent bowel movements, and a constant nagging feeling of needing to move the bowels. In about one third of cases, fever is present. Entamoeba histolytica ameba under an electron microscope. The amebds extensions are called "pseudopodia" (soo-do-PO-de-a). It uses them to move about and also to surround its food before ingesting it. 1992 Alex Raksosy, Custom Medical Stock Photo. condition is known as amebic dysentery (DIS-en-ter-y) and often leads to severe dehydration (excessive loss of body water). If the amebae move through the bloodstream to other parts of the body, pockets of infection and pus can form in other organs. In about 1 percent of cases, the amebae infect the liver and cause a condition known as hepatic (he-PAT-ik) amebiasis. The symptoms of hepatic amebiasis include fever, a distended (swollen) abdomen, and pain and tenderness in the area of the liver just below the right ribs. How Is Amebiasis Diagnosed and Treated? The most common method for diagnosing amebiasis is examining stained stool smears under a microscope. Entamoeba histolytica also can be identified from samples of tissue obtained during visual examination of the colon with a flexible instrument called a colonoscope (ko-LON-o-scope) or during surgery. If doctors find Entamoeba histolytica, they will prescribe medication for asymptomatic carriers (who can spread amebiasis if the amebae are not killed) and for people with active infections. Treatment usually lasts for about three weeks. There is no vaccine or prophylactic (disease-preventing) drug for amebi-asis. Prevention of amebiasis depends on maintaining clean drinking water supplies, disposing of human waste properly, and using appropriate hygiene measures, such as thoroughly washing hands after going to the bathroom and before eating. Municipal water supplies approved by local health departments in the United States are usually considered safe. When camping or traveling in other countries, however, it is important to use water only from safe sources and to avoid sources such as mountain streams. Nearly 500 million people worldwide may be carrying the Entamoeba histolytica parasite, but only about 50 million people develop symptoms of amebiasis. Although the Entamoeba histolytica parasite is found in the United States, the disease is a much larger problem in developing nations in the tropical areas of Africa, Latin America, and Asia. Poor sanitation, inadequate water treatment, and the use of human waste as fertilizer contribute to the problem. Worldwide, amebiasis causes up to 110,000 deaths each year, but fewer than a handful of those deaths occur in the United States. The U.S. Food and Drug Administration's Center for Food Safety and Applied Nutrition posts a Bad Bug Book at its website that includes a fact sheet about Entamoeba histolytica. The U.S. Centers for Disease Control and Prevention (CDC) has a Division of Parasitic Diseases that posts a fact sheet about amebiasis infection at its website.